Hello my name is Evie. I will tell you how my friends helped me restore my weather feather. I am one of the weather fairies. The friends I have mentioned their names are Rachel and Kirsty. 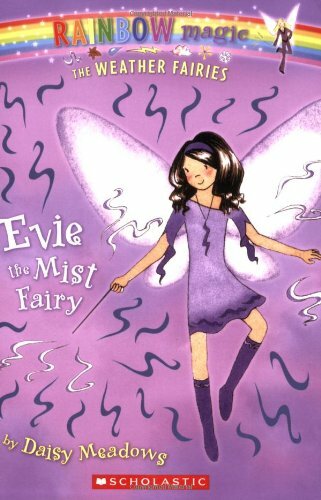 In this book we tricked a goblin into giving the weather feather back to me so that I could take it back to Fairyland. I want to tell you how we tricked the goblin. When we got to know that the weather was not good and it was very foggy, we knew that it was goblin mischief. The same day Kirsty's mom was taking part in the running competetion. We tried looking for the goblin but we couldn't find him. When we were flying we heard a moan. We stopped to see who it was. It was a goblin. We quickly hid in a tree. The goblin was moaning because he was tired and did not want the mist feather. We even saw that the goblin saw a human and thought it was a pogwurzel. When the goblins were small they were very naughty, so their mother said that if they trouble them a pogwurzel will come and eat them. From that time the goblins think that humans are pogwurzels. I tried to ask him in a polite way that could he give my feather back. But he was too stubborn to listen. When we were thinking that time Rachel had an idea. She asked me that if I could use my magic to imitate the voice of a pogwurzel? She said she had enough magic to do so. Rachel told the idea to Kirsty. Kirsty liked the idea very much. I transformed them to their normal form. They hid behind a tree and then ran out and started shouting that a pogwurzel was chasing them. The goblin was frightened when we came running like that. Then I used my magic to imitate the voice of a pogwurzel. It was funny to watch the goblin scream. The goblin was so scared that he begged for me to clear the path so that he could run away. He gave my feather back and then I cleared the way for him. Now I told you how we tricked the goblin. Hope you enjoyed it!